Homecare can reduce the care workload that professionals and health institutions are facing due to increasing need for care that our current society demands. Relying on the emergence of technological innovations in homecare could empower patients to undertake a more active role in the care practice. Understanding the value of technologies to support patients’ awareness and reflection of their own progress is considered as an important step in designing appropriate mechanisms that fit patients’ needs. This chapter discusses an integrated patient-centric approach to design homecare technologies considering patients’ personal experiences and social context as crucial aspects when providing care support. This approach proposes the development of in-situ methods and tools to provide a holistic view of patients’ care experience through the design of interventions in the context of use. The development of Experience Sampling for Total Hip Replacement (ESTHER) is presented to illustrate the benefits and challenges of conducting in-situ research by supporting the collection of physical activity and emotional states of patients during the progress of their recovery. 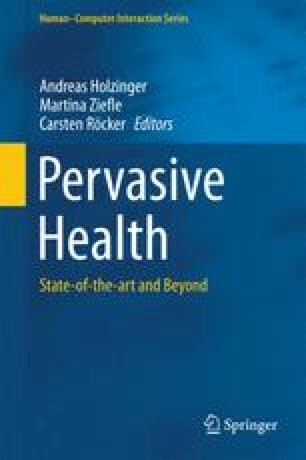 The transition from open and simple interventions to more complex and specific ones opens the discussion of the role of technology to introduce new practices that uncover richer experiences by influencing patients’ care activities via self-reporting and self-reflecting mechanisms. The subtle introduction of technologies to uncover general and more specific experiences does not only address research needs, more importantly it brings an understanding on the acceptance of technologies in patients’ care practices. The consequence is a new generation of “research to application” tools that bring a closer understanding of patients’ experiences and context to inform the design of supportive homecare technologies that embrace a more active role of patients. This work has been partially financed by SENIOR project consortium. Special thanks to the Department of Orthopaedics of Reinier de Graaf hospital for their support in gathering participants which kindly volunteer to contribute to this research. FuelBand and Nike+app: Nike’s new fuel SE highlights. (2013). http://www.fastcodesign.com/3020080/nikes-new-fuelband-se-highlights-its-ux-flaws. Retrieved from 21 January 2014. Outcome measures in patient care. (2013). http://www.apta.org/OutcomeMeasures/. Retrieved from 21 January 2014.